Currently, there are trillions of pieces of trash in the ocean, destroying ecosystems and claiming animal lives. Scientists are working hard to develop new forms of biodegradable plastic that will ease this issue in the future. But as for the existing trash, innovative recycling is the best way to fight the tide of plastic pollution. Environmental programs are extricating pounds of plastic waste from the oceans and now Adidas is giving some of that material new life in the form of sneakers. Later this year, the company will release a line of shoes made from plastic collected along beaches and pulled up from the ocean floor. For now, they won't be collecting the tiny fragments of plastic that float about the water—doing so simply isn't feasible—but by pulling from the coastline, they'll prevent new plastic from entering the ocean ecosystem. "We're saving life. Every piece of plastic that we collect, every single piece, can save a bird, a turtle, even a whale," Cyrill Gutsch, founder of Parley for the Oceans, a new Adidas-supported nonprofit, told Fast Company. In addition to using recycled trash for the shoe's material, Adidas will employ a knitting process that virtually eliminates further waste. Unlike cutting out a pattern to sew together, a woven structure doesn't leave behind scrap material. "We use what we need for the shoe and waste nothing," said Eric Liedtke, Adidas Group executive board member of global brands. 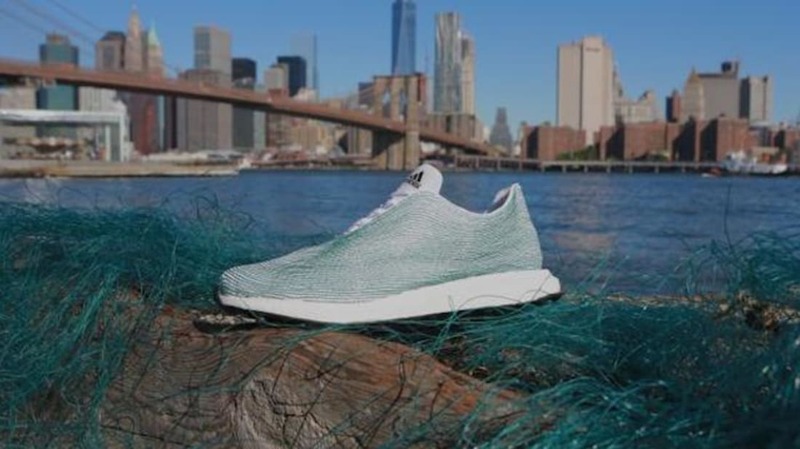 The prototype incorporates an illegal gill net—dredged up from the ocean by the nonprofit Sea Shepard—that not only saves fish lives in its absence but also gives the shoes an interesting aesthetic. It's unclear if commercial versions of the shoes will look the same, but as Adidas gets more fluent in the process of giving trash plastic new life, they're hoping to expand beyond footwear. "We don't have to limit ourselves," said Lietke. "We can put this in T-shirts, we can put this in shorts, we can put this in all kinds of stuff."